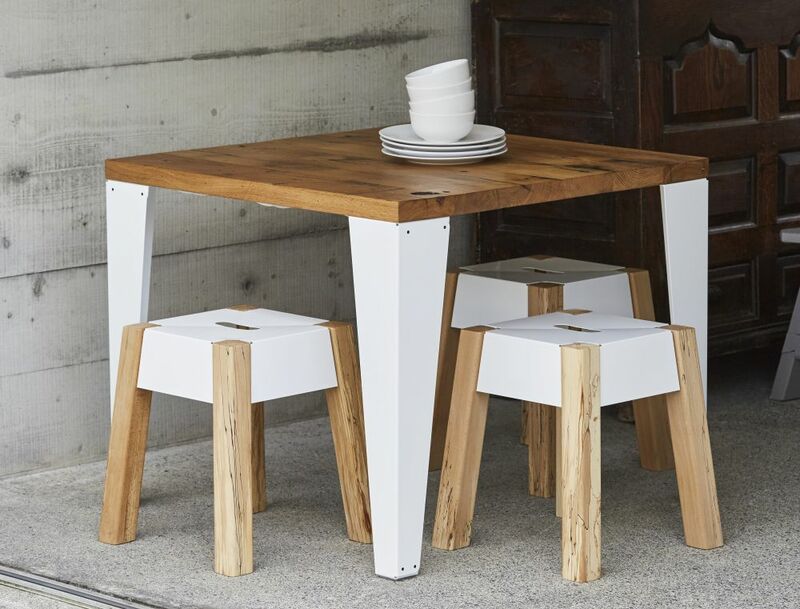 Beautiful contemporary café/dining table ideal for cafes, restaurants or kitchen dining rooms. Beautiful contemporary café / dining table hand made from reclaimed French oak. Ideal for cafes, restaurants or kitchen dining rooms. The Oak used in this table once served as flooring and walls of French Railway Wagons. When we first get our hands on the Oak boards they are black with soot from the old steam trains. Hiding under that soot lays a timber full of characterful burls, knots and cracks. Time has allowed the soot to seep into the cracks and holes highlighting them in jet black. The larger blackened holes in some of the pieces are from red hot rivets burning through the timber to join them to the steel wagon frames. That's how they fixed the boards in the days before mechanical drills were portable or practical enough to do the job. The charred edges of these holes tells us the story of their past. This table sits on our sturdy folded steel ‘Jam legs’. Black rivets help to draw attention to the folds in the steel. The gloss white legs contrast with the deep amber tones of the knotted timber. This particular table is finished in a hard wearing satin polyurethane varnish. We also offer a beeswax finish with our own recipe 100% natural beeswax polish. Each table we make uses reclaimed timber which has its own unique character. The table top is 4cm thick solid timber. The table is 90cm wide by 90cm long and can sit 4 people. Also available as 75cm x 75cm for more compact settings.